The 2016 Milwaukee Rally Has Finally Arrived! | Hupy and Abraham, S.C. The 2016 Milwaukee Rally Has Finally Arrived! Summer is nearly over, but riding season is not! 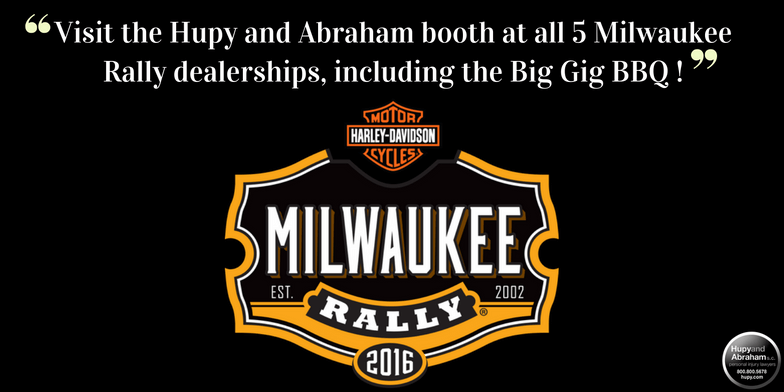 This year, Hupy and Abraham, S.C. is proud to return as an official sponsor of the 2016 Milwaukee Rally -- the largest free motorcycle rally in the Midwest. The 2016 rally will feature five days of events spanning across the five local Harley-Davidson dealerships, as well as the Harley-Davidson Museum. Over the long Labor Day weekend, Thursday through Sunday, attendees will be treated to live music, food and drinks, and vendors that riders are sure to love. To top it all off, the Rally will culminate Sunday at Henry Maier Festival Park for the first ever Big Gig BBQ, featuring two stages of live music and, of course, barbecue. Hupy and Abraham is also pleased to sponsor the popular Run for Cash giveaway again in 2016. Participating riders will have the option to collect stamps at each of the five Harley-Davidson dealerships, and the Harley-Davidson Museum in the Milwaukee Rally tent. After all five stamps are received, riders will be eligible for a random drawing for several cash prizes. Participants in the Run for Cash will also receive a 2016 Milwaukee Rally collector coin. View the official rules here. All of us at Hupy and Abraham hope you have a wonderful Labor Day weekend, and remember to stay safe! Due to the Rally and the coinciding holiday weekend, there will be many motorists and pedestrians around town, who may not be familiar with the area, and therefore less attentive to riders. We encourage you to stop by any of the Hupy and Abraham booths and get one of our “Watch for Motorcycles” stickers or T-shirts, and other rider-friendly safety and awareness materials. But, if you’re unable to attend any of the Rally events, you can still get your free “Watch for Motorcycles” sticker here.